Srinagar: Terming the killings in Kashmir’s Kulgam district as a brazen display of human genocide, Tehreek- e- Hurriyat Chairman Mohammad Ashraf Sehrai on Monday said the no ‘power or repression’ can break resolve of freedom loving Kashmiris. 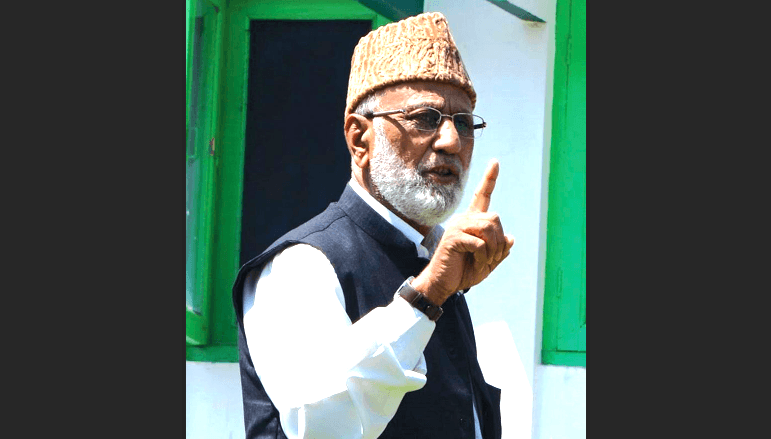 In a statement, Sehrai said that under a “well-planned conspiracy”, the forces in absence of any accountability, have decided to go for a full fledged war against people of Kashmir. “The government forces have failed to suppress the Kashmiris and are now using inhuman and brazen tactics to suppress their resolve. However, the sacrifices rendered by the people won’t go waste,” he said. Paying tributes to the people killed in Kulgam, Sehrai said that people of Kashmir were associated with a great and sacred cause and the repressive measures won’t cow-down people or resistance leadership into a submission. Meanwhile, a complete shutdown is being observed in Kashmir in the aftermath of seven civilian killings in Kulgam which took place on Sunday. A powerful explosion after a gunfight in Laroo village of south Kashmir’s Kulgam district in which three militants were killed led to the death of the civilians.